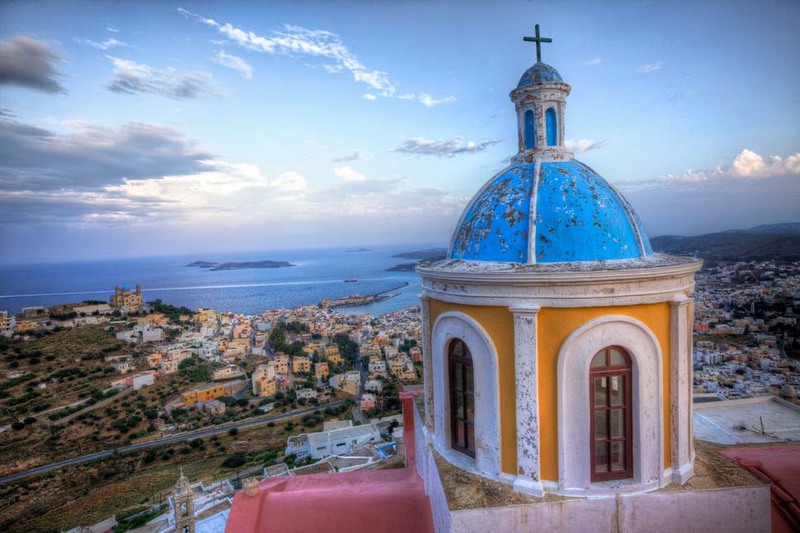 If you are considering spending Easter time in one of the Aegean islands, the rustic island of Syros in the center of the Cyclades is bound to offer you an unforgettable experience! A walk in Ermoupolis will fascinate any visitor. Everywhere you go refined and classical buildings take you back to an era of superior aesthetics and splendor. 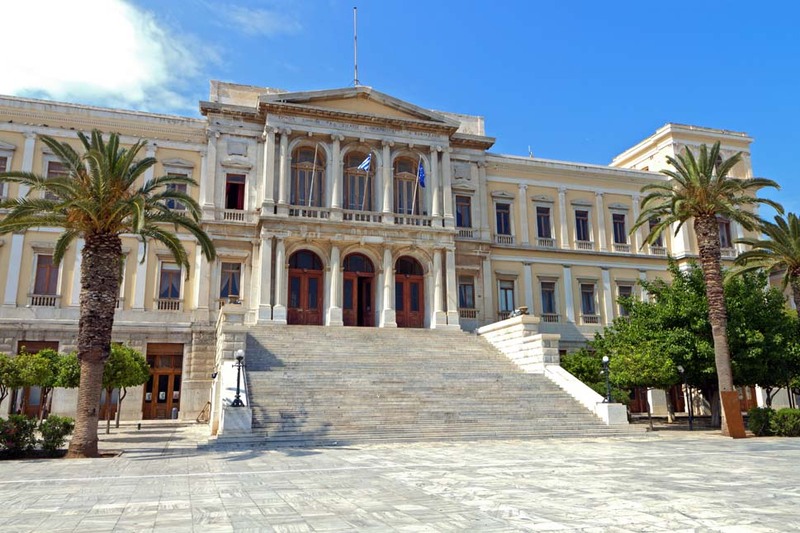 The City Hall, the Apollo Theatre and Miaoulis Square bear the stamp of neoclassicism and romance, as expressed in western European architecture. Stylish with majestic neoclassical buildings, traditional cafes, labyrinthine alleys and houses with flowery courtyards: the Cycladic capital immediately puts you in a spring mood and sets the celebratory atmosphere that prevails these days. Jasmine and honeysuckle and freshly baked tsoureki (a brioche-like braided bread), Easter cookies, and the sweet goat-cheese pie baked by the local cooks on Holy Monday; scents that captivate the senses in each step. 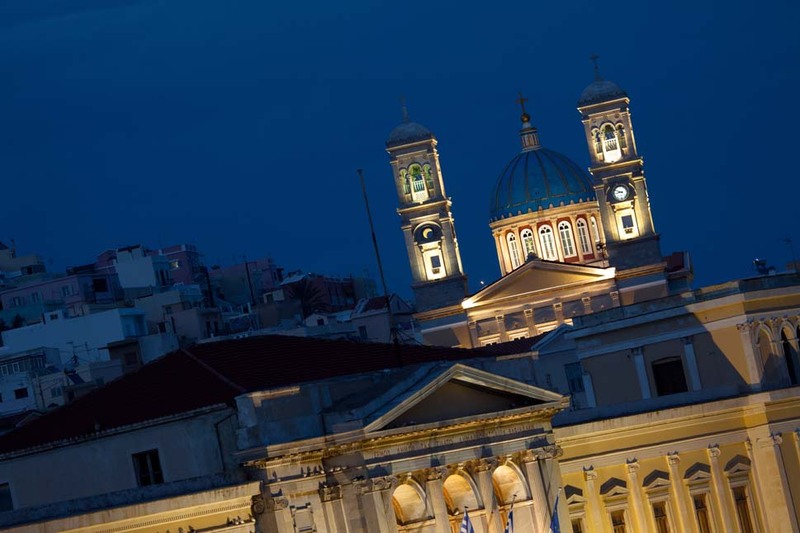 Each Day of Holy Week in Syros is an opportunity for discovery, relaxation and spiritual uplift. 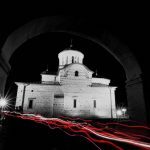 The exquisite Church of St. Nicholas located in the prestigious district of Vaporia to listen to the famous polyphonic choir, established in 1920, singing the Hymn of Kassiani in the midst of devoutness on Holy Tuesday. Take the time to explore and spot the towering bell towers, the large marble staircase and the imposing propylaea with the four Ionic columns. 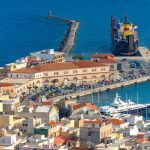 Holy Friday is a very special day for Syros. 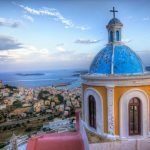 The epitaphs of the Catholic temples of Saint George and Saint Sebastian roam the cobblestones of Ano Syros accompanied by sponges, tunics and dices hanging on wooden poles, symbolizing the Passions of Christ. Correspondingly, the orthodox epitaphs of the churches of Saint Nicholas, the Assumption of Virgin Mary, and Metamorfosis walk the cobblestone streets of Ermoupolis, before gathering at Miaoulis Square. Local people and visitors sit on the steps of the Town Hall holding lighted candles and with watch; the choir of Saint Nicholas chants the Holy Friday hymns and the Philharmonic orchestra follows. 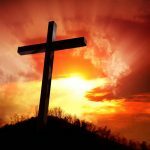 Holy Saturday morning and the orthodox churches’ bells signify the First Resurrection, the priests scatter lemon leaves and the Christians knock on the wooden church seats vigorously to exorcise the evil. Syros is slowly getting ready for the night of the Resurrection. 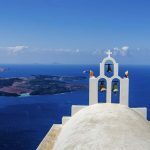 If you want to hear ‘the Risen Christ » while admiring a panoramic view of Syros and watch the fireworks, Saint George and the Temple of Resurrection, located on opposite hills in Ermoupolis, will compensate you for your trouble to reach their peak. 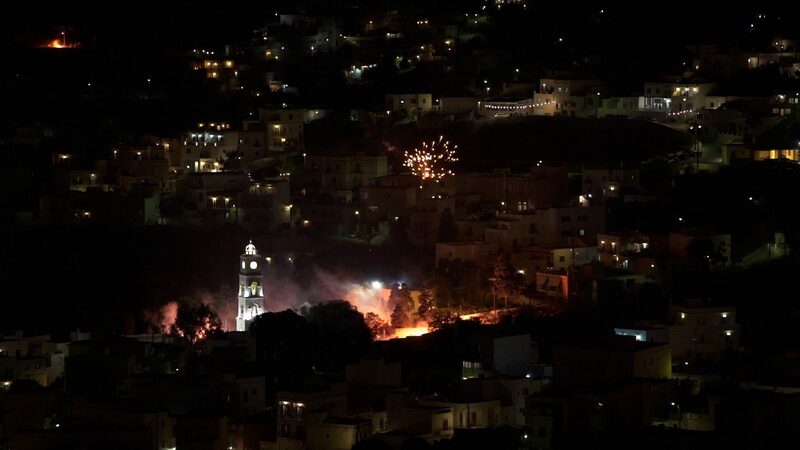 And when the bells start to ring joyfully, firecrackers and fireworks are thrown from the hills of Ano Syros and Dilio, painting the sky red and carrying the message of the Resurrection to every corner of the island! After the mass of the resurrection comes to an end, the Catholics accompany the statue of the Christ, decorated with lemon blossoms and lilacs, from the temples of Saint George and Saint Sebastian to the cobbled streets of Ano Syros. As Holy Saturday comes to an end, the traditional dish of magiritsa awaits: a lamb in the oven with lemony potatoes and is followed, of course, by the tapping of the red dyed eggs! For your festive dinner, either choose the taverns situated in the port and the city or the ouzeris (tavernas serving ouzo) in Ano Syros. Either way, you’ll enjoy full flavors and high quality of ingredients. An alternative choice would be San Michalis tavern at the highest point of Ano Meria. 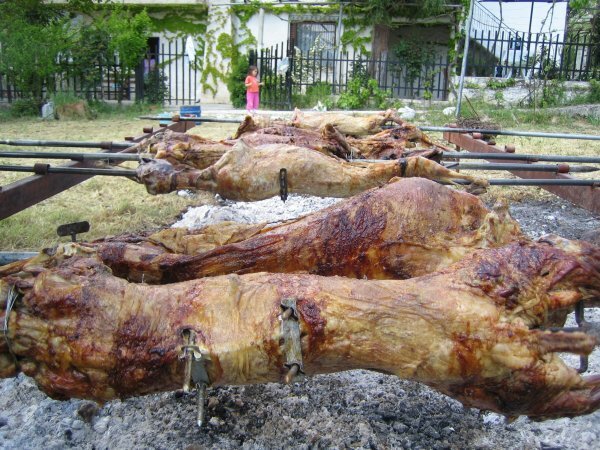 On Easter Sunday, the lamb and kokoretsi that are traditionally made on the spit over fire in the yards and the taverns of the island will entice you to take an early seat on the Easter table! In the afternoon you can attend the Mass of Love at the church of Metamorfosis or see the burning of Judas in the Byzantine church of the Assumption of the Virgin, famous for the original image created by Dominikos Theotokopoulos, the famous El Greco. 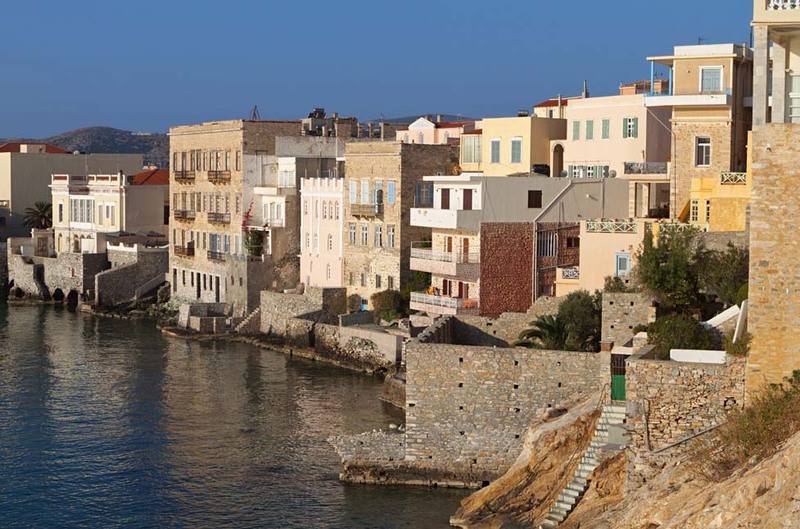 Finally, when it’s time to leave, you’re left with one thought: Easter in Syros is the experience of a lifetime!